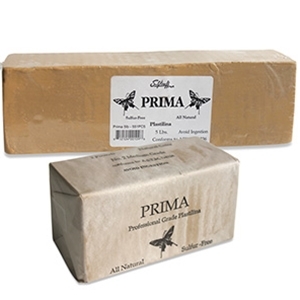 PRIMA Plastilina is an all natural professional-grade modeling material formulated sulfur-free. PRIMA is oil- and wax-based and will become more pliable over time. Since it does not contain water, it will not harden; heat will not adversely affect the modeling clay. Our PRIMA modeling clay is a medium consistency, ideal for sculpting heads, busts and figures. This smooth-working, premium-grade clay is a favorite among the best sculptors. PRIMA Plastilina - 2 lbs.